There are plenty of reasons to be unhappy, frustrated, and upset. My list in the last couple weeks includes a clogged drain, being the victim of a crime, a friend fighting cancer, Ferguson, ISIS, and what they’ve done with The Hobbit. Others make me consider the “cursed animosity” of people, which is much, much worse, of course. I know I need to do what I can to bring order to disorder, reconciliation to ruptured relationships, and perspective to panic. And I am learning about the frequent need to lament, (despite its rarity in our culture). But most of the time, I (and probably you, too) make one of two mistakes. The first mistake is to submit to all the unhappiness, frustration, and conflict. I take it in. I load it upon myself. I don’t allow myself to be happy. How could I?, I think, with all this going on? The second mistake is to fear comparisons to others. I think this might be a product of my upper-Midwest, northern European lineage. If I am happy, I must hide it. Because if I’m happy, and someone else is unhappy, frustrated, or upset, I may make them feel worse. Today, I spent some time taking stock of my life. I just had a great weekend of rest and fun with my family. My kids got excellent comments on their report cards. 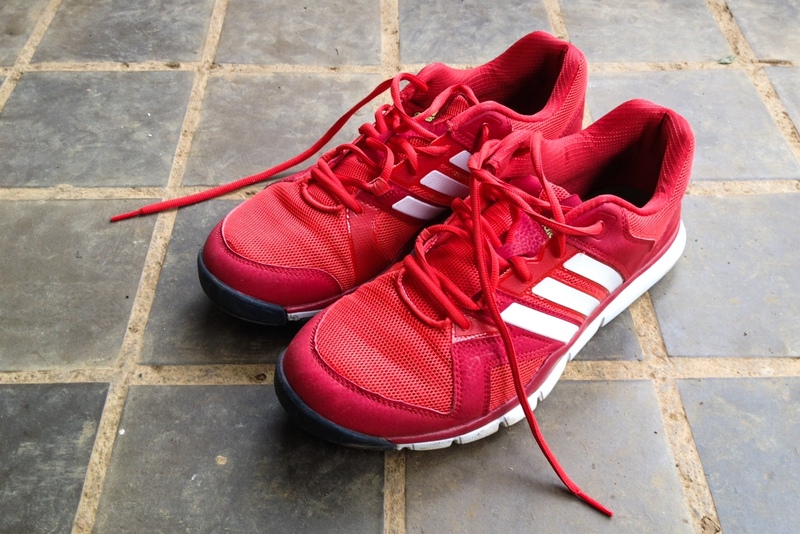 I am healthier than I’ve been in years, with sweet new red running shoes. My work is interesting and rewarding. I’m fresh off a great trip meeting fascinating colleagues from around the world. In short, I have plenty of reasons to be happy. To focus on all the problems around me is to miss the good that is present in my life today. And to not notice the good that is present is to not give thanks for it. So today, and this year, and in this life, I look around, I notice, I give thanks, and I am happy. Today, this year, in this life, I look around, notice, & give thanks. I am happy. Join me. They *are* very nice trainers. They make me happy from afar.